Despite being one of the most sought after professions in Nigeria, fashion designing comes with its challenges. Aside from the fact that you have to transform raw fabrics into well-fitted styles of different variations, you still have to join these fabrics perfectly with just the right seams and stitches, fitting the shape and curves of the design to taste of the customer. In addition, delivery must be done on time. For a long time, manual sewing machines have been the means for these transformations. It’s perfectly safe to say that operating manual sewing machines is strenuous, usually involving sitting for a painstakingly long period of time. This means, most times, you can’t still get the work done on time, coupled with fatigue and other factors — finding a suitable alternative is perhaps hastily important. Luckily, we are now flooded with newer technology — an electric sewing machine world where speed, accuracy and flexibility are guaranteed. I’ve compiled a list of electric sewing machines for your reading pleasure. How Much is an Electronic Sewing Machine Sold in Nigeria? Butterfly is unarguably the most popular sewing machine brand in Nigeria. 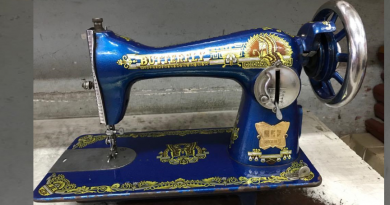 It remains one of the best sewing machines in the country and the most preferred choice amongst Nigerian fashion designers just as they were several years ago. If you are a fashion designer thinking of a brand of the electric sewing machine for your business, this brand is a good choice for you. Read on as we look at some notable features and prices of different Butterfly electrical sewing machines in Nigeria. The JD2340QB is one of the new generation electrical sewing machines from Butterfly. It doesn’t need to be oiled, which makes it clean and easy to maintain. The top-loading quick set bobbin is easier to thread than the traditional front-loading sewing machines. It comes with led lighting providing much brighter light to sew with low consumption and will last the life of the machine. The included extension table gives you an additional workspace for craft and sewing project. Key features; 198 built-in stitches, automatic buttonhole, fast bobbin winding system, digital operation adjustable, built-in needle threader, soft cover case. Makes sewing simple and more enjoyable, whether on a new or old project. Easy to operate when sewing clothes and other fabrics. Key features; multi-functional zig zag embroidery machine, built-in led pilot lamp, quick winding bobbins, a weight of 7.2kg. An electric sewing machine that’s a good choice when there’s an available power supply. It reduces the stress often caused by using manual machines. Key features; electronic, multi-functional zig zag embroidery machine, quick winding bobbies, built-in led pilot lamp, a weight of 6kg. Are you planning on learning to sew? Then, you have gotten the best sewing machine for yourself. 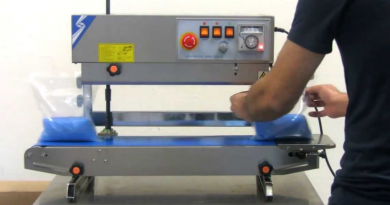 Can be used as traditional flatbed machines and can be converted to free arm for stitching of curves and sleeves. Also, equipped with led light, which of course enables you to sew even at night. Key features; 14 stitch functions, top loading bobbin, auto-set stitch length and width, 4 step buttonhole, free arm, maximum stitch width of 5mm, a maximum stitch length of 4mm, instruction manual, electric power, a weight of 6.2kg. A top table machine used for making button-hole, zig zag sewing, and giving fabrics a perfect finish. It mainly made of metal and can be used at home or in the office. Key Features; built-in led pilot lamp, free arm, variable needle positions for top precise top stitching, four-step buttonhole, size of 430×227×356mm, a weight of 7.1kg. Features; an automatic clutch for bobbin winding, tension with an accurate setting, easy slide reverse lever, four-step buttonhole, strong torque, 60 stitches with an oscillating hook, three needles, a weight of 15kg. The best brother sewing machines help make sewing easy. The top-loading bobbin design makes swapping out threads a simple task and preparing the machine is also quite a simple task as well. Sewing speed is also nice and consistent. Having great features like led lighting and automatic buttonhole will help you create a great style with just the press of a button and other amazing features, which makes sewing fantastically wonderful. This is definitely one of the best sewing machines for beginners because it offers everything you need to sew with one-touch convenience. Features include; a zipper foot and built-in zipper insertion stitch to help you get neat lines, even if you have got to switch close to the edges. Overcasting lets you get a serger result and designer top switching is simple thanks to the 7 one step button stitches. For a person who wants to have casual sewing experience, this sewing machine offers stitches you want and a price you like. Features include; up to 60 stitches with an ability to adjust stitches length and width. It also comes bundled with an LCD display, intuitive stop and start button and also variable control that allows you to adjust the speed of each stitch. From an overall perspective, the Brother SE400 provides a lot of great features and automatic options for a pretty outstanding price. Comes equipped with 7-point feed dogs and offers a smooth fabric feeding experience even on the toughest of materials. Features include; a needle threader that is completely automatic. Features a plastic body, 13 stitches, electric pedal, 3 extra presser foot (zipper, rolled hem and amp design), and detachable compartment. 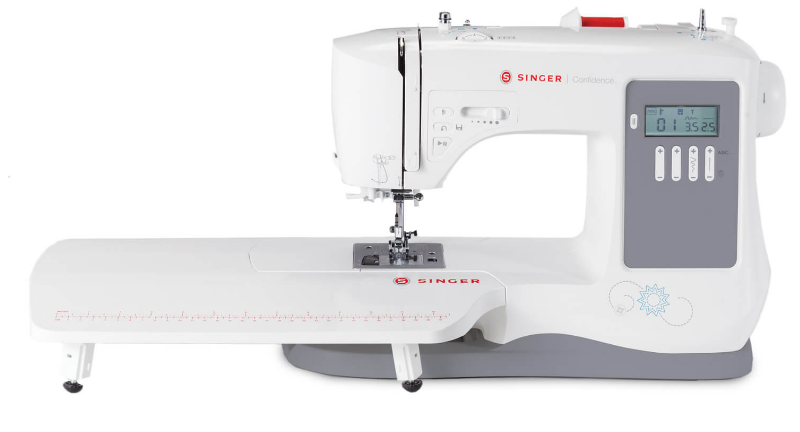 Features a built-in selection of 8 stitches (flat) with a selector dial, stretch stitches, maximum width and length going up to 5mm each with adjustable control on the length, a four-step buttonhole, walking foot and quarter inch seam foot, horizontal bobbin loader, solid metal body, and twin spools. 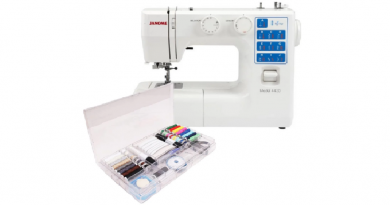 Features an automatic needle threader (no need to strain your eyes, easily adjust stitch length and width with the touch of a button), bright two-digit led screen, easily select one of 30 built-in sewing stitches with front switch panel and led screen, start and stop button which enable you to start sew without foot control, auto-declutch bobbin winder, easy reverse switch button and precise thread tension.